Navarathri just got over and I had a huge bunch of Betel leaves left out. Even if we consume 2 or 3 leaves a day, I am sure we cannot finish them on time and it would spoil. 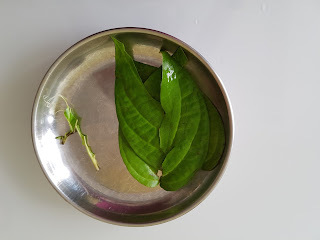 With the left out Betel leaves, I generally make a thogayal (chuntney) which can stay upto 3 or 4 days. If it is cooked with more oil, then it would for stay more than a week. Today’s post is about Vetrillai thogaiyal (Betel Leaves chutney or Paan Chutney). 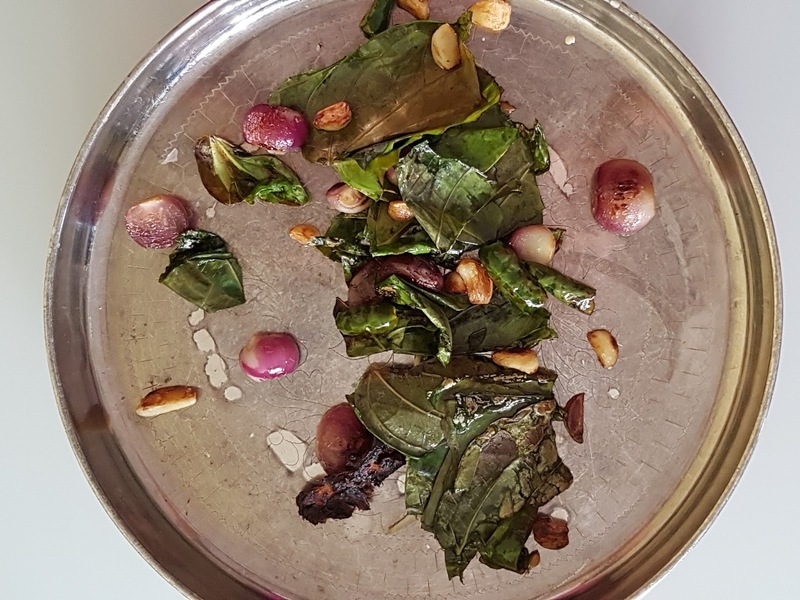 Betel leaves are fried & blended to a nice paste along with small onions, green chilli , tamarind , garlic and other spices & condiments. Consuming plain betel leaves have amazing health benefits and often it is ignored by many people. Some of the health benefits are improvement in oral health, digestion, reduction of gastric pain. Betel leaves are given as a part of post natal diet in Tamilnadu as it helps digestion. Apart from consuming them they have benefits when used externally. 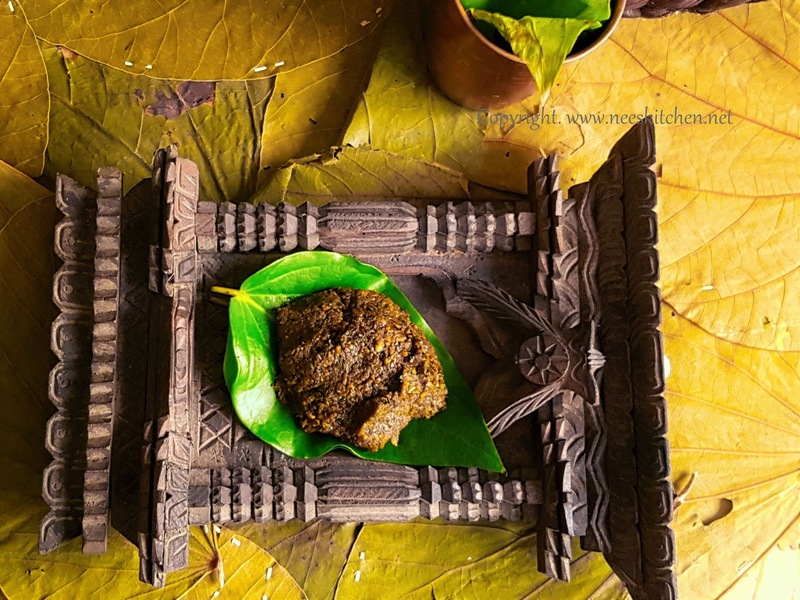 The recipe is similar to a regular gongura (sorrel leaves) pachadi with some minor differences. 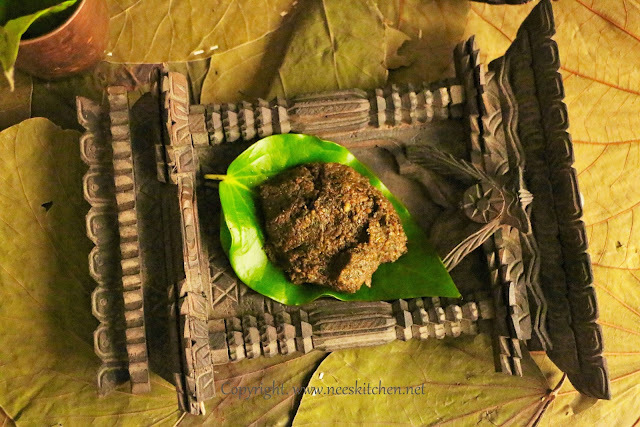 I had added tamarind and reduced the chili content as Betel leaves are spicy and not sour. I had used green chili. You may replace the green chili with red chili. 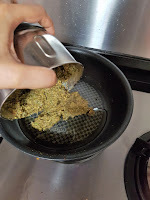 It is a must to grind all the dry and wet ingredients separately. If this is not done the spices will never get mixed well. Salt must be added only while combining wet and dry ingredients mix as that is the right time to determine how much salt is needed. 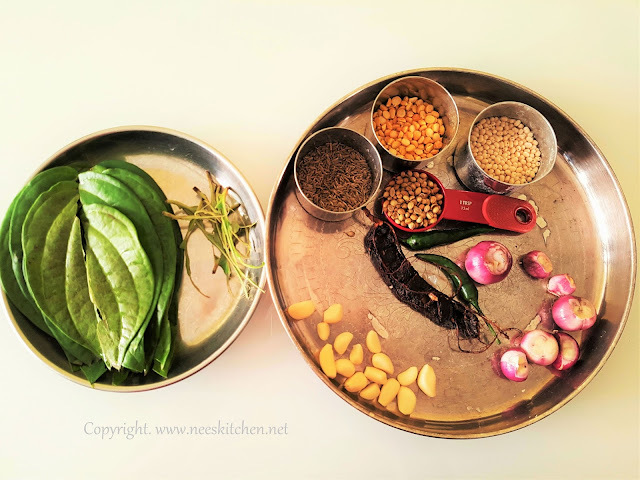 The chutney is ideal for rice or chapattis. I did not personally like it while dipping it for idly or dosa, though my daughter had it with everything. 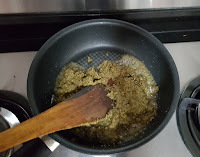 The chutney is quite spicy, hence while giving it to kids mix them with moderate amount with rice and add ghee. Alternatively, you may completely ignore the green chili if you feel the spice in betel leaves are enough. Adjust the amount of oil based on how long you wanted to store. More duration needs more oil similar to a thokku (pickle). 1. Wash and clean Betel leaves. 2. Tear the stem in between the leaves. Peel the small onion and garlic cloves. 3. 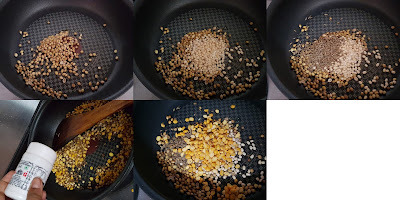 Take a non stick pan and add 1 tblsp oil. 4. Add garlic, small onion & green chili. Let it fry nicely. 5. Add Betel leaves and fry for 1 or 2 minutes until its color changes. 6. Switch off the gas and add the tamarind on the same hot pan and keep it for 2 minutes. 7. Transfer to another plate to cool down. 8. While this is getting cooled down, on the same pan add few drops of oil and add Coriander seeds,urad dhal, jeera,channa dhal and hing powder. Fry until nice aroma comes out. It takes around 3 – 4 minutes. 9. Let it cool down and powder them and transfer it separately. 10. Meanwhile the Betel leaf mixture would have cooled down. Blend them to a nice paste. 11. Transfer the dhal powders into the mixie and blend well adding salt at this stage. 12. Add 1 tblsp of oil in the nonstick pan and heat it. 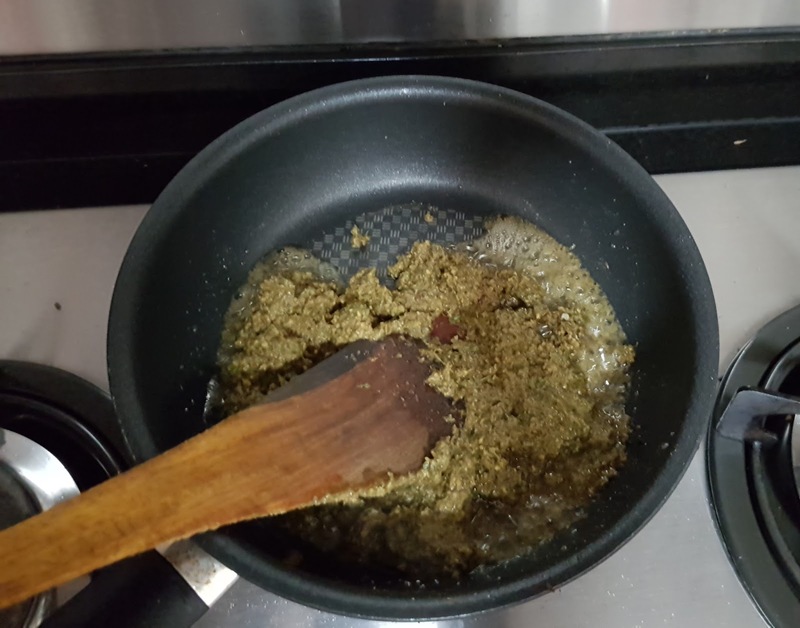 Transfer the thogayal/chutney into the pan and fry for 3 -4 minutes. Oil might not ooze out as it is too less for this quantity. Betel leaves thogayal is ready. Mix it with rice with a dollop of ghee. è Betel leaves are already spicy, hence adjust the chili. è If you want to preserve for a week, add more oil on the last step in such a way that oil oozes out.